John “Gunner” Gunnell is a frequent contributor to Speedville and Engine Builder magazine, and owns Gunner’s Great Garage, a restoration shop in Manawa, WI. In his book My Years with General Motors (a must read for anyone interested in automotive history) Alfred P. Sloan, Jr. opines that it was possible, way back in 1959, for Chevrolet to build an entire year’s worth of cars without any two being exactly the same. Sloane—who was running GM when the corporation was the absolute powerhouse of the car industry—based his view on the wide variety of colors, trims, options, accessories and power train choices that Chevrolet offered buyers at the time. 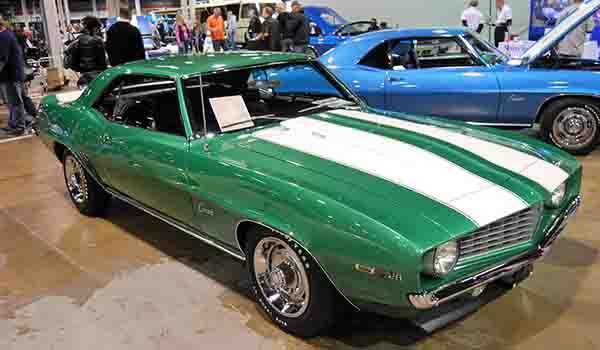 A bright green 1969 Chevrolet Camaro Z/28 Sport Coupe that appeared at the recent Muscle Car & Corvette Nationals in Rosemont, IL was a good example of Sloan’s wisdom. 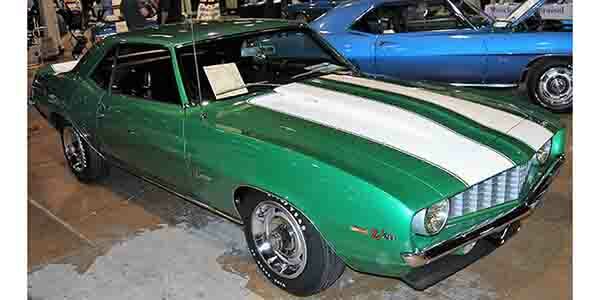 The car is the only documented Z/28 with an X11 trim tag and “M” code engine block. This Z/28 has been in the hands of the same owner – Al Krebs of Bucks County, PA – for three decades and has been driven just 49,000 miles. In 2004, Krebs started restoring the car. As the work progressed, he discovered that there were no other documented cases of a Z/28 with an X11 trim tag. Camaro expert Larry MacNeish says that the car is the only one he has ever inspected with what he calls an “X11 error.” He thinks that the car, a very late-production unit, had a dealer order that was mistyped. By the time someone noticed the error, the body tag had already been affixed to the car, so the Fisher Body Co. build sheet information was updated to one-of-a-kind status. In 1969, an X11 trim tag indicated the installation of the optional Z21 Exterior Style Trim Group that included bright wheel opening moldings, bright drip moldings (coupe), fender pinstriping, rear fender louvers and black body sill headlight and taillight accents. This was not supposed to be available on Z/28s. Camaro engines were commonly stamped with a date code format showing year/month/day. For example, 8C26 would decode as 8=1968, C=March and 26=26th day of the month. A common cast-in date code format was month/day/year. B129 would decode as B=February, 12=12th day of the month and 9=1969. There was one exception to these conventions, which was an engine block with an M code. Research by the Saginaw Metal Casting Operations of the GM Powertrain Division has found that the M codes were not date codes. They were actually a foundry code that was used to identify parts that were made to evaluate a casting process change. After evaluating the parts, the M code blocks would either be destroyed or released into production. There is no way to determine the date that an M code block was poured. The bright green car has both the X11 tag and the M code stamping. It also has A01 Soft-Ray glass, the D55 center console, N40 power steering , the U16 factory speedometer, the U63 AM radio, a Z12 ducted hood, the Z21 style trim group, the Z23 interior group and the G80 posi-traction rear axle. These features make it a very unique Chevrolet in anyone’s book, not just Sloane’s opus.